I came across an article on lifehacker that explained how to create a heat map from your Google Location History. I can't add much to the article but I'll try. When I went to Google Takeout I requested my "Location History" to be archived and to e-mail me a link. I never got the e-mail. I went back to Google Takeout and to "Manage Archives" and downloaded the archive from there. 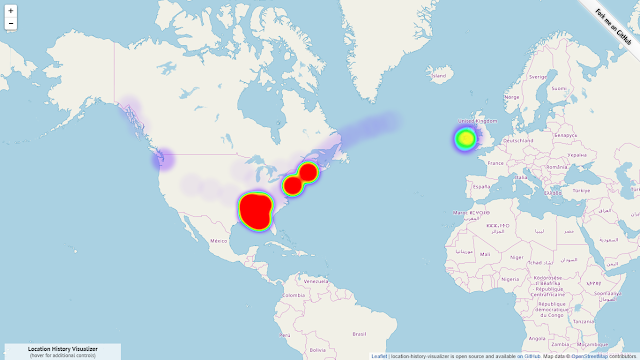 Then when I went to Location History Visualizer, it took me a while to find where to create the heat map. This is the direct link. 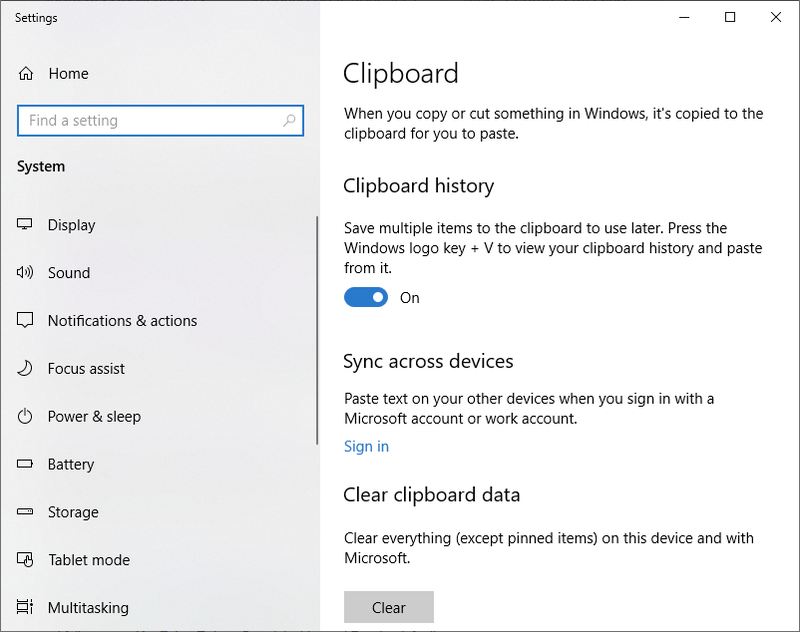 Do you remember how Microsoft Office has a clipboard manager that stores a history of your copied strings? 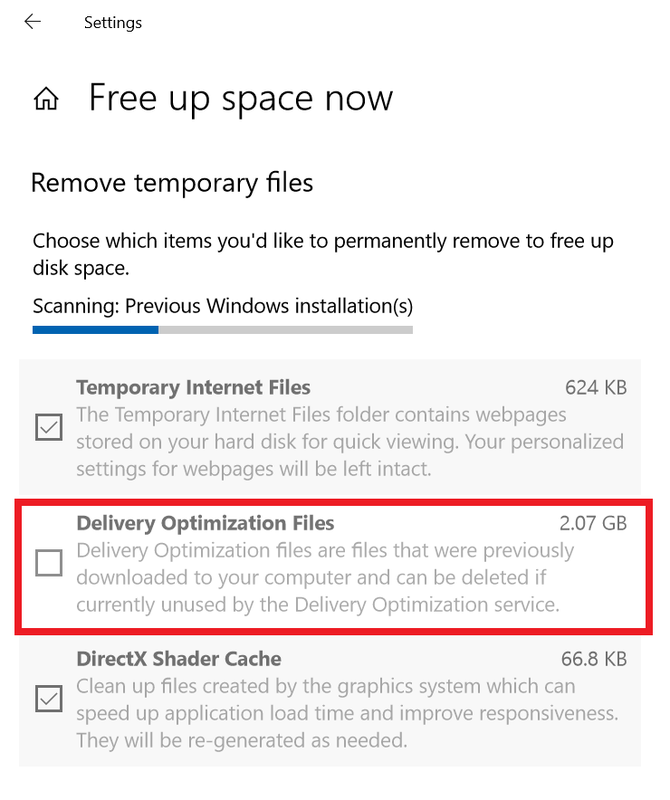 Well, now Windows 10 1809 has pretty much the same thing. You do have to turn it on by going to Settings / System / Clipboard. 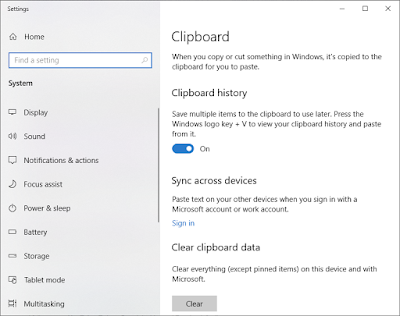 In the "Clipboard history" section, move the slider from "Off" to "On". Then select and copy as usual. 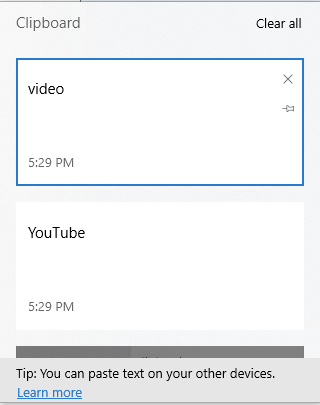 Then if you want to paste from your copy history, press Windows key + V. Find the clip you want to paste and just click on it. If you want to paste the last clip you took, just press Ctrl + V as you're used to. The camera on Google's latest Pixel 3 smartphone introduced "Night Sight" capability in the Camera app. Initially it was available on only Pixel 3s but has trickled down to all Pixels with varying capabilities. But Android is a community of hackers. Almost immediately this new Camera app was cross-ported to several other Android phones. Of course my current Essential PH-1 was one of the ports. Why have I installed a couple of the ports? Well, honestly they're still a little rough around the edges. For example, the Essential PH-1 lets you set an app to launch on a double-press of the power button. Typically that is set to the camera app. 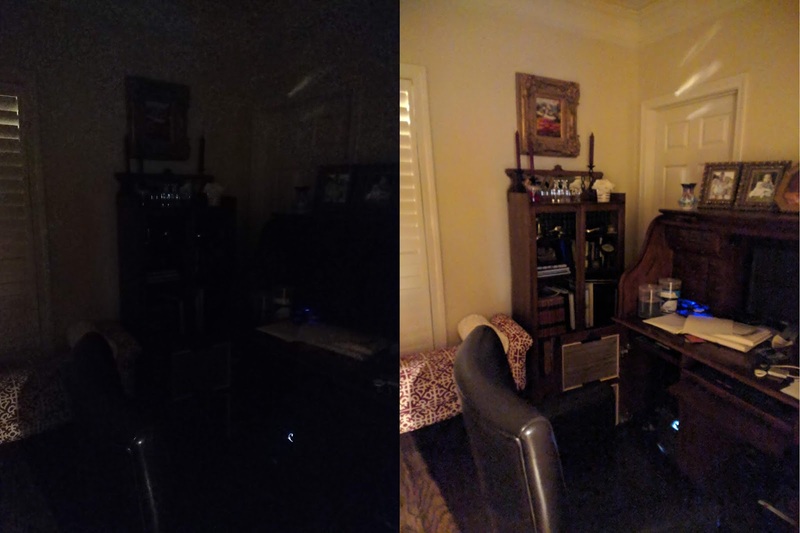 On the first port of the Night Sight camera that I tried would prompt for additional permissions when invoked with the double-press of the power button. The second port I tried consumed a lot of battery and wouldn't take photos back to back while is was doing HDR+ processing. The delay due to HDR+ processing may be normal but I hadn't run into it before. Current status is that I have a Night Sight camera app (GoogleCamera_6.1.013.216795316-debug.apk) installed but it is not my default camera. Since at least Windows 7, Windows has had a Snipping Tool. 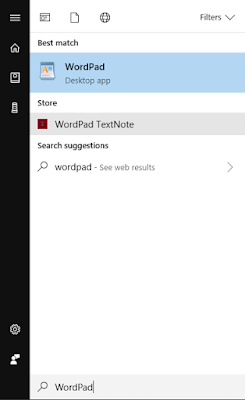 I've always accessed it by pressing the Windows key and typing "snipping". Or you can press Windows key + Shift + S, then drag your cursor over a portion of the screen to capture it. The Snipping Tool had some simple mark-up tools. 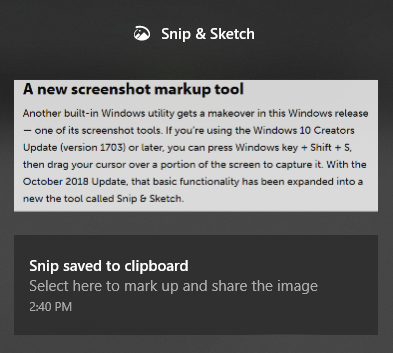 In Windows 10 1809 the Snipping Tool is still there but there's a new Snip & Sketch UWP app. 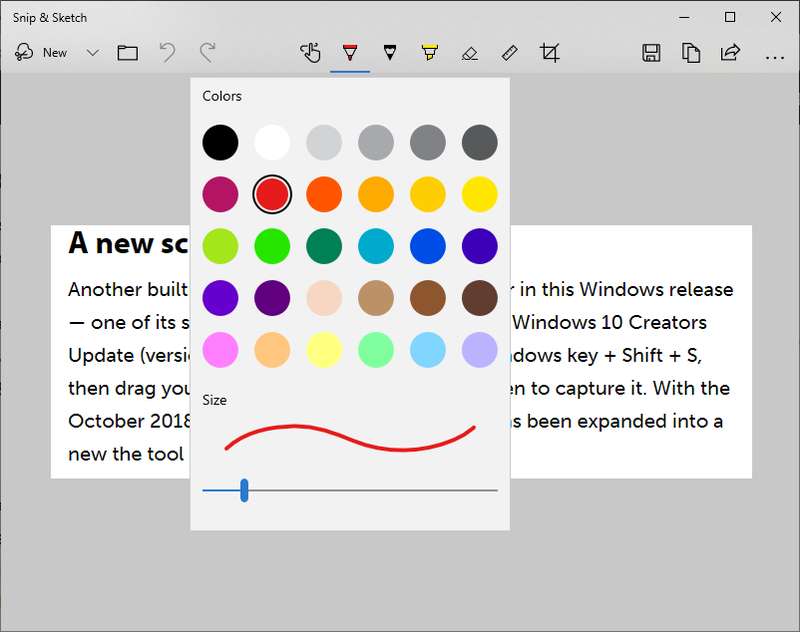 Pressing Windows key + Shift + S brings up a small toolbar with icons let you capture a rectangular portion of the screen, the entire screen, or a freehand-drawn portion of the screen. 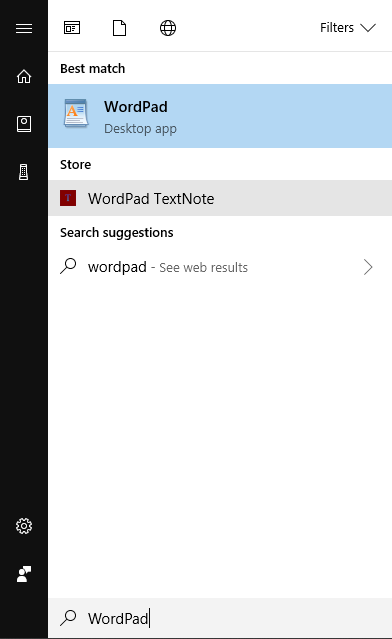 If you click on the notification you'll see the UWP app with the editing tools. 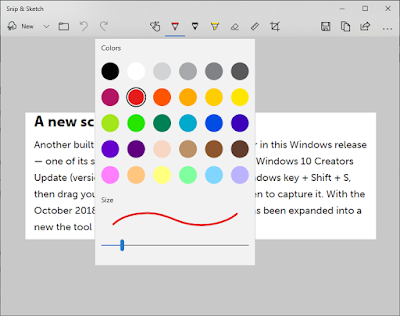 These are much more capable than those in the pre-1809 Snipping Tool. It's simple but certainly a nice improvement. As I wrote back in October, I had hastily installed Windows 10 1809 just before Microsoft pulled it. I still haven't had any problems with it. However I came across this post that pointed out that those PCs that had installed Windows 10 1809 hadn't gotten ANY updates since the October Cumulative Update. 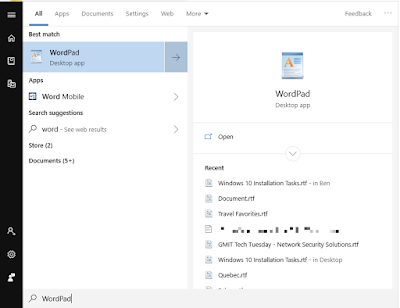 This is significant as Microsoft has merrily been fixing the numerous problems discovered in Windows 10 1809 and pushing out new builds to Windows 10 19H1 through the Windows Insider Program. So I wanted to get updated. But not jump into the fire with Windows 10 19H1. In the above mentioned howtogeek.com post, a thread in the comments pointed me to a windowsupdate.com URL that contained the CAB file for Windows 10 1809 build 17763.107. Search the comment thread for KB4464455v2. 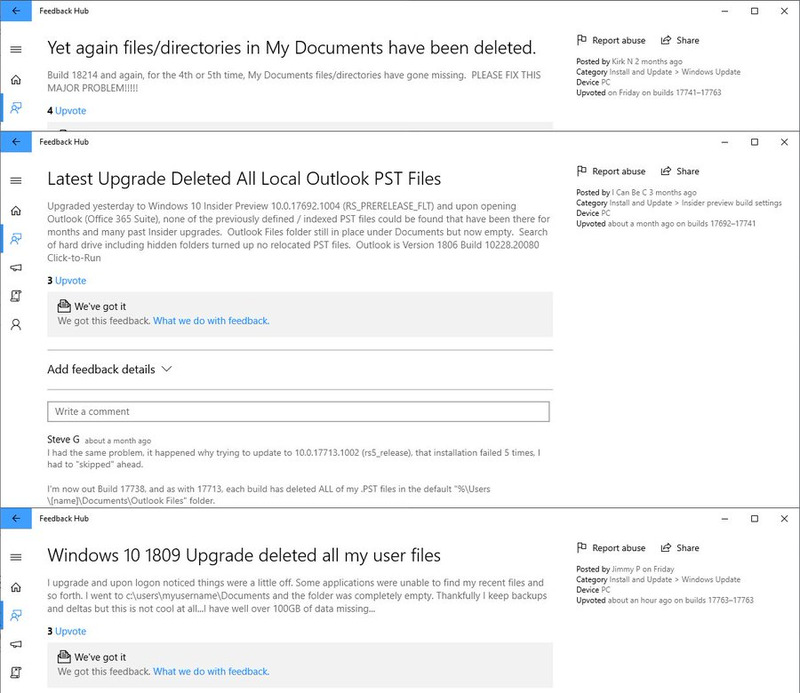 Microsoft has apparently had problems even with that as there are 2 versions of KB4464455. Now, what to do with a CAB file? As has become typical with Windows 10 1809, nothing is easy. You have to use Microsoft's DISM to install the CAB. Here are the instructions. It took a while and then I had to reboot. You're going to have to think about this one some. Think about how any anti-virus program has to parse all the files on a system. A parser could inadvertently enable arbitrary code execution if that parser has any vulnerabilities. Run the parser in a sandboxed environment where malicious actions are limited to the sandbox thereby protecting the rest of the system. Microsoft's Windows Defender does this. In other words, the Windows Defender antivirus process that analyzes downloaded files and other content will run with very few permissions. But it's not turned on by default. Then restart your PC by holding SHIFT while you select Shutdown or Restart on the Start menu. I'm a regular listener to TWiT's Security Now podcast with Steve Gibson. On a recent podcast Steve mentioned AV-Comparatives' anti-virus testing. If you're a regular reader of this blog you also know I'm a fan of Windows Defender. AV-Comparatives' September 2018 test (PDF) showed that Windows Defender was in the very top performers. Given that Microsoft is one of the 6 AVs with a perfect score, maybe just using the system built into Windows is sufficient protection. tl;dr What should you do? First, I'm moderately aggressive in applying updates across a variety of systems and I've not had any problems. Second, look at Woody Leonard's post on ComputerWorld. There's some hyperbole there but overall not bad advice. Microsoft has had a bad month with Windows 10. They've had problems with Display Audio issues (jpeg), file deletions (archive.is), HP keyboard (archive.is), and most recently audio problems (archive.is). I'm not going to rehash all these problems but Microsoft has to step up to the situation that they have 700,000,000 Windows 10 users. That's a lot of zeroes! 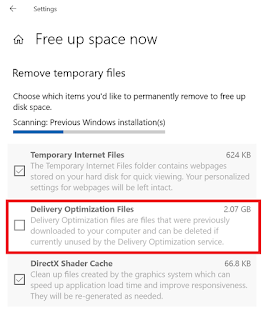 One of the response to the above problems was that it only affected "one one-hundredth of one percent of version 1809 installs." If that had rolled out to the entire population that would have been 70,000 users. When I was at FedEx, I heard Fred Smith speak a number of times. One time he talked about the "Golden Package." His point was that we (the FedEx employees) couldn't let the numbers mask the impact of every service failure. Fred instituted a Service Quality Indicator (SQI) system where service failures were measured not by percentages but by the count of failures. It didn't matter that a given failure was a minuscule percent of service. 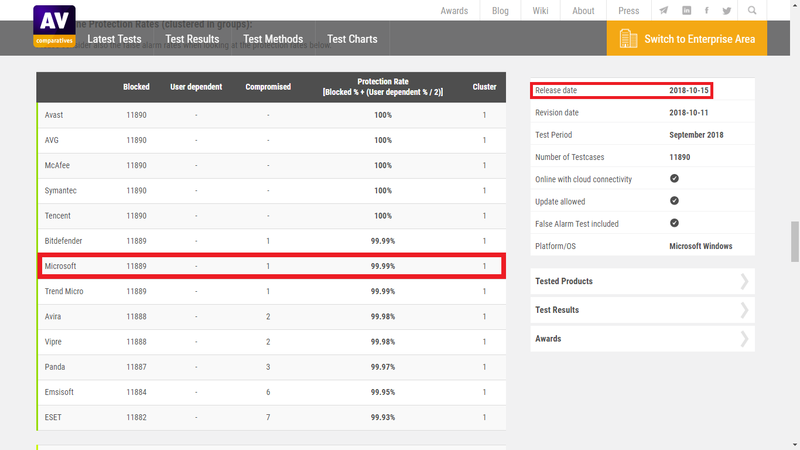 Each service failure got reported, researched and counted against our performance objectives. That made a difference as the number of nightly packages skyrocketed. Maybe Microsoft needs to take a similar tact. This isn't specifically MY rant although I've stubbed my toe on it. If you haven't already go back and read Part I and Part II. Chrome 69 logs the user in to Google automatically when they sign in to any Google service. Adrienne Porter Felt of Google's Chrome development team posted a series of tweets "clarifying" this. They just made me more confused. Her "/4" tweet is where I stubbed my toe. 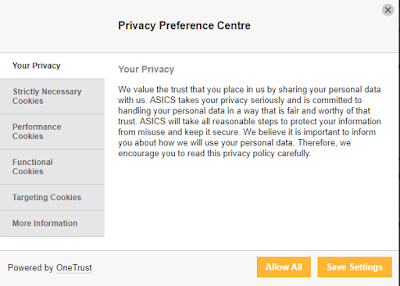 Plus, you now only need to sign out in one place before you share your computer with someone else. When my wife signed out of Gmail, it signed her out of Chrome and complained loudly about it (post) (archive.is). For the time being you can go to chrome://flags//#account-consistency and change this behavior but these workarounds tend to not live long. The flag appears to be broken in Chrome 71 and above. Here's a post (archive.is) from someone who's really upset with the change. Here's a post (archive.is) that's a little bit more middle of the road. Microsoft seems to have made a mess of their latest rollout of Windows 10. Windows 10 October 2018 (1809) dropped on 10/02/18. While it's a long list, there's not really much new in there. It turns out that many users are complaining that the upgrade process DELETED their personal files, Documents, Pictures, Music, Videos, etc. 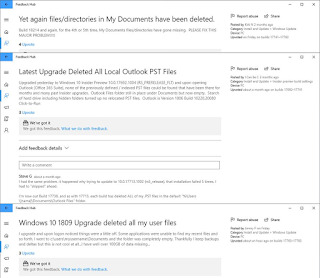 This problem with the 1809 upgrade had been reported by the Windows Insiders (testers) but Microsoft still released 1809 to the public. Windows users who clicked "Check for updates" got it instantly. If you have manually checked for updates and believe you have an issue with missing files after an update, please minimize your use of the affected device and contact us directly at +1-800-MICROSOFT, or find a local number in your area . Wow! "[P]ease minimize your use of the affected device" and "please don’t install it." And while you've got a little time, now is a good opportunity to practice your backup AND restore. Incidentally, I've updated my sacrificial laptop to 1809 with no problems. Chrome 69 introduced so many changes it's taking several posts to cover them. 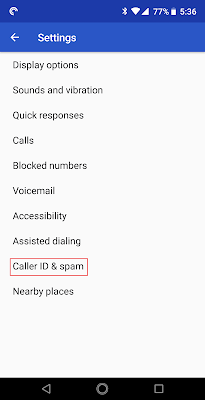 In the Chrome  address box's "resting state" -- in other words, when you aren't typing in it or otherwise interacting -- Google now hides the HTTP or HTTPS prefix and strips out website domain qualifiers like the initial "m." that indicates a website geared for mobile devices. We are exploring ways of drawing attention to the right identity indicators at the right times. You can try this by browsing to benmoore.info. Then double click on benmoore.info. Chrome now considers the "www" to be a "trivial subdomain". Others are "m" and "amp". What's "amp" you say? Funny you should ask. AMP is Google's Accelerated Mobile Pages. Google's AMP strategy has been fraught with controversy over how these pages are hosted. Hiding the "amp" subdomain is being seen by some as a way to quell this controversy. Set it to "Disabled". Relaunch Chrome. These work-arounds tend to disappear over time. Chrome 70 seems to walking this back some. On September 2, 2018 Google's Chrome browser turned 10 and Google released Chrome 69. I'm not picky about subtle UI changes like rounded tabs vs. slanted tabs or even different color palates. Things that make it harder to do what I use a browser for is what really bothers me. Chrome 69 took the user icon out of the title bar and put it on the toolbar. When it was in the title bar it showed your first name. In that entry I changed my "name" to "." so it almost didn't show in the title bar. Chrome 69 moved it to the toolbar and now it shows your avatar. And you can't hide that icon like you can hide extension icons. Prior to Chrome 69 when you hovered your mouse over the "X" of a tab to close it, the background of the "X" turned red. That provided a clear indication that you were about to close that tab. Now the background of the "X" turns to white. This doesn't give much contrast on the gray background of the tabs. Notice that this highlighting is completely invisible on the tab in focus as the tab is white. Prior to Chrome 69 when you opened an incognito window the top left of the title bar had a spy icon. It was a very obvious indicator that you were in incognito mode. Now when you open an incognito window there is a gray spy icon in the toolbar which has a gray background. Much less obvious. I guess I'll get over it but I just don't understand how any of these are improvements. You know what GDPR is, right? Great, then we can keep going. 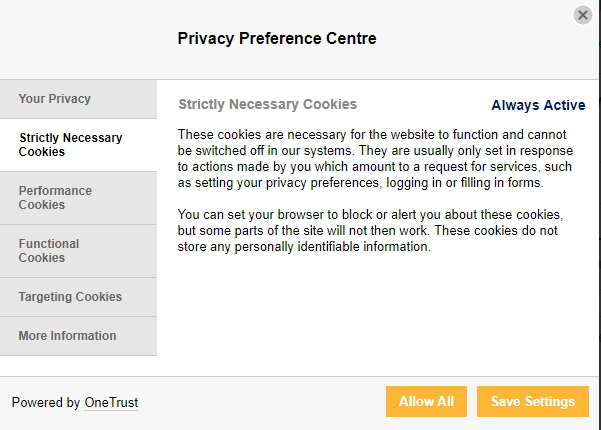 One of the most visible results of GDPR is all the cookie notifications you've been seeing. Here's what's behind all that. Informed: Why, how and where is the personal data used? 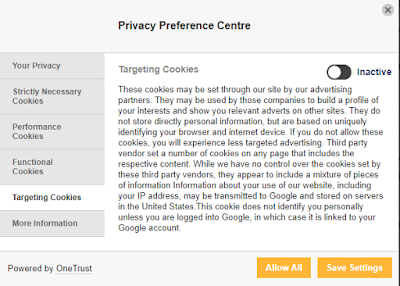 It must be clear for the user, what the consent is given to, and it must be possible to opt-in and opt-out of the various types of cookies. 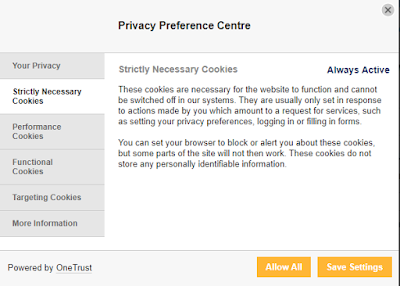 Based on a true choice: This means, for example, that the user must have access to the website and its functions even though all but the strictly necessary cookies have been rejected. Given by means of an affirmative, positive action that can not be misinterpreted. Given prior to the initial processing of the personal data. Withdrawable. It must be easy for the user to change his or her mind and withdraw the consent. But don't just click through those pesky notices. Click on them and wade through them. It's pretty fascinating what's in them. Recently I logged into runkeeper.com. I didn't just click on the bright yellow "✔ Accept cookies" like most people would. 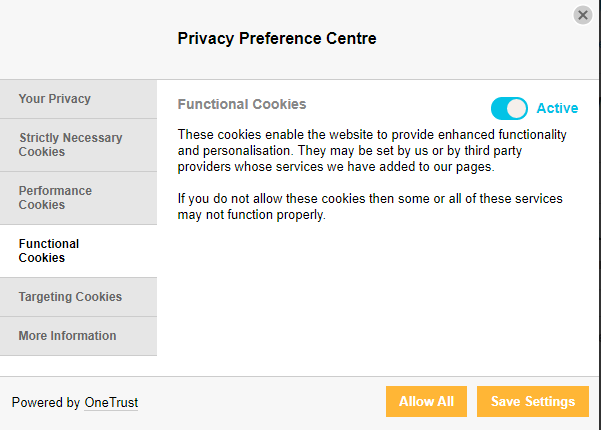 Rather, I clicked on "> Cookie Settings". Look at how much control I had over what cookies would be stored! 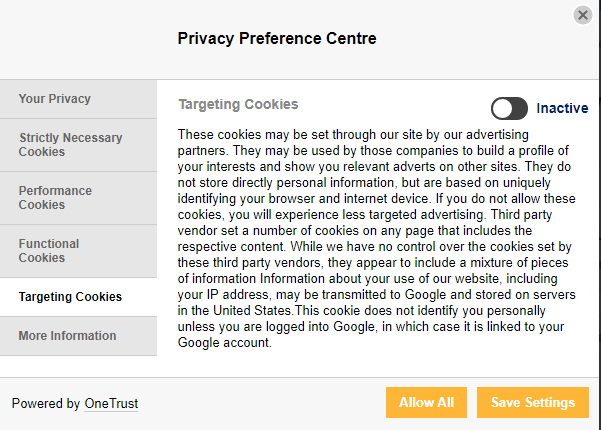 I was impressed that the "Targeting Cookies" were turned off by default. I flipped all the switches to "Inactive" and noticed no degradation in performance or function. By the way, here's the site referenced in the fine print at the bottom. Somebody is making a lot of money. 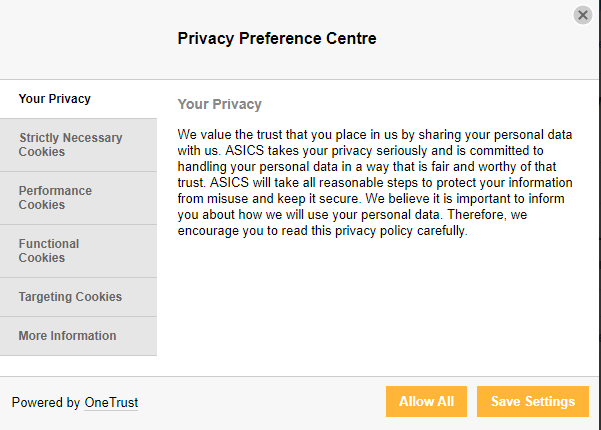 Some of these dialogs have actually given me the choice of which partners the site can share my information with. 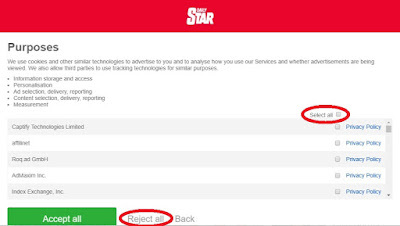 Here's what I got from the Daily Star. 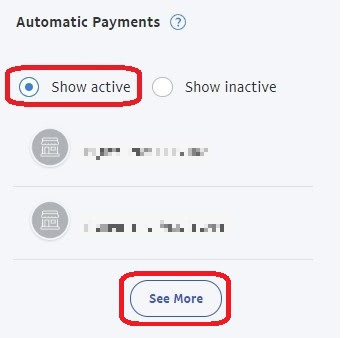 Don't click on "Continue and Accept All". Rather click on the tiny "here". On the next screen click on "Continue to partners". Look at that! They gave me a list of all their "partners." 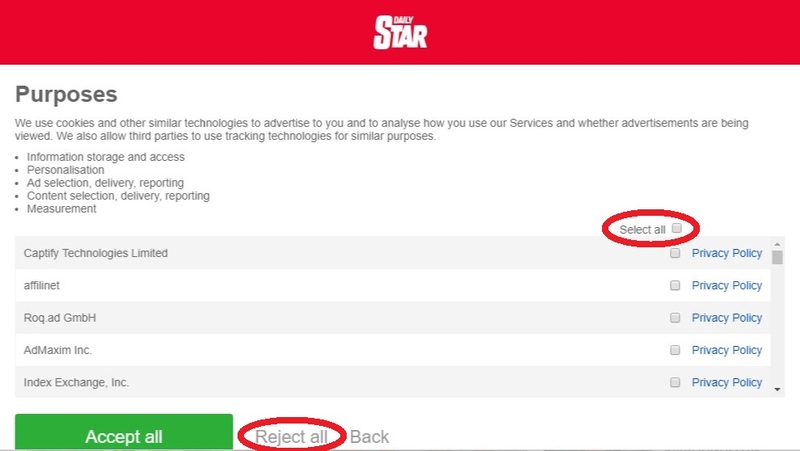 Click on "Select all" and then on "Reject all"
I like online tools so I don't have to install software. I like free tools because they're, well, cheap. Here is a collection of online audio/visual tools that I've used. They tend to disappear over time so if one isn't working any more, drop me a note and I'll tell you if I've found a replacement. Sometimes I want to "zoom in" a video before I share it. The way I do this is to crop the video just like I would do a still. Like a still, I lose some resolution but it gets the focus where I want it. Video-Crop is what I use. Like their web site says "You can find here damn simple and juicy tool for video cropping." Especially in my dashcam video sometimes there's audio that isn't appropriate to share. AudioRemover is what I use. When I come across a video, usually YouTube, that I want to extract the audio from and make an mp3, convert2mp3 is what I use. If I have an mp3 that I want to trim down, e.g. for a ringtone, I use mp3cut.net. To increase the volume of an audio clip, e.g. for a ringtone, I use mp3louder.com. I can choose how many decibels I want to increase the volume. 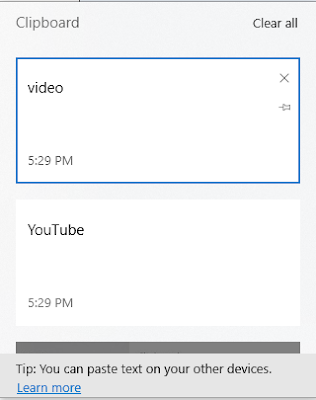 If I want to save a YouTube video, I need to convert it to a format that I can store. I use ClipConverter to do this. Notice that ClipConverter has a variety of output formats. I have some old audio files (wav, amr, etc.) that I want to convert to mp3s. Online-Convert does it for me. When all else fails, I try CloudConvert. 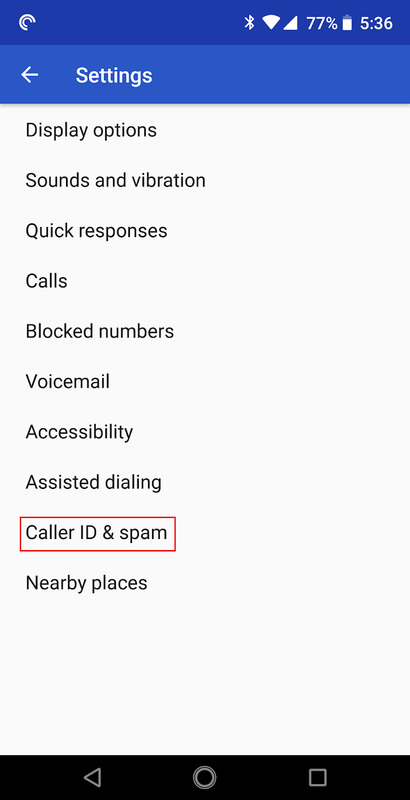 Years ago I posted about how I was sharing selected contacts between Google accounts. The solution I discussed at that time has gone paid only so I went looking for alternatives. I found CoContacts that works great for me. CoContacts has a free offering that supports 3 users with 3 shared groups with 100 shared contacts that sync daily. If you need more than that you should be paying for it. I'm using it on G Suite accounts but it will also work with regular Gmail accounts. It works so elegantly that I couldn't remember what I was using for contact syncing! I hadn't even gotten my Android Messaging post published before everything changed. Inexplicably, AT&T Messages had started working again. Pulse was working great. Then Google changed the world. This has 90+% of the function of Pulse for free and delivered by Google, not a third party. The web presentation is way more Material Design than Pulse but I thought Pulse was fine. Messages for Web doesn't have scheduled messages and I've used them a couple of times. I'll miss them but will trade them for an integrated solution. I had trouble getting the Android Notifications working like I wanted but that may just be my unfamiliarity with Android 8.1 Oreo notifications. The web presentation is a little more chatty than Pulse in that it asks you if you want to run Messages for Web if you have it open in more than one place. If you have an active web presentation you don't get the notification on the phone. That's problematic when you have been using the web presentation and then walk away from the PC. It seems to take a couple of minutes (5?) before it will resume sending notifications to the phone. The messages get delivered to the phone just without notification. The Android Messages client generates battery warning messages now and then that you can turn off and the web presentation reminds you that the phone is not on Wi-Fi. That's easy to turn off as well. Head over to messages.android.com on whichever PC or laptop you want to text from. You'll be greeted with a massive QR code. Open up the Android Messages app on your phone. Tap the "Scan QR code" option and point your phone's camera at the QR code in the browser window. Your phone will buzz with a vibration and you'll be all set up and ready to go. Your conversations will show up on the left hand side of the browser window. There's really lots more in this latest update of Messages. Read it all here. 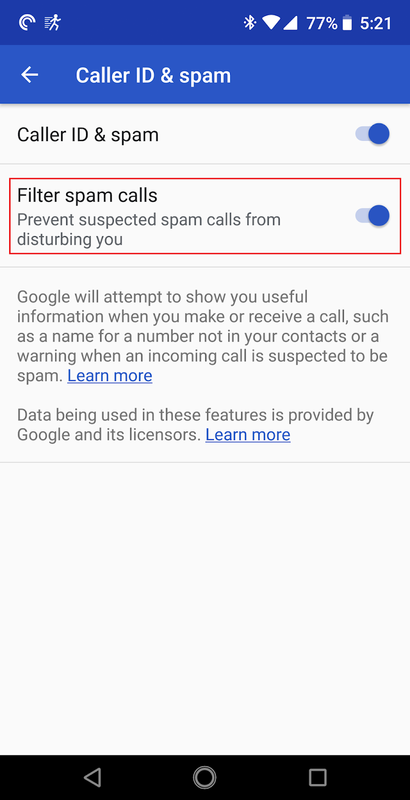 Now I just wonder when Google will kill this. PS. I'm not sure about Android Messages for Web. Since I've purchased the lifetime subscription for Pulse ($10.99) I've gone back to Pulse until I can sort out Android Messages for Web. I have been using AT&T's messages.att.net for months. It worked well. I called AT&T and they said to ignore it. That was wrong. After literally months of calls to AT&T their story was that they have discontinued this service except for non-phone devices, e.g. tablets and watches. Another story was that it only ever worked for AT&T branded phones. But we know different, don't we? So I went off on a quest for alternatives. I first tried Join. Here's a brief write-up on it. I thought it was an interesting implementation. It uses your Google Drive as a place to store the text messages. It runs an app on the phone that watches the Google Messages app and sends the data to your Google Drive. Then I used Join's web version to view the text messages. 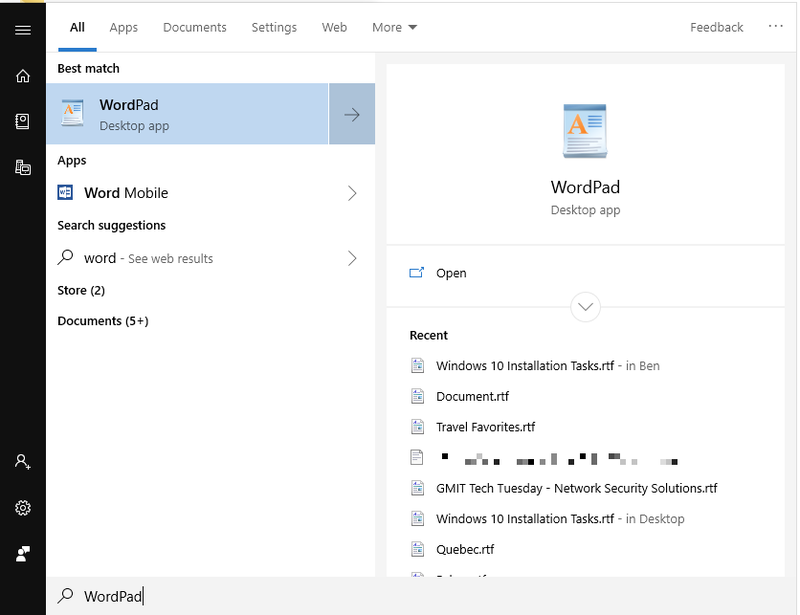 In addition to the web presentation Join offers a Chrome extension and a Windows 10 app (paid). The web version has a 60 second timer between updates and often paints the messages out of sequence and omits messages. The web version doesn't support displaying MMS pictures yet. The author said he will have to add that in the future. In a group thread you can't tell who the author of an individual message is. The other presentation methods may address these issues but I wasn't impressed. The next app I found was Pulse. Pulse is simple and fast. Here's a good write-up on it. Pulse installs a replacement app on your phone for Google Messages. I wasn't wild about that but it really works nice. By being the default SMS app the Pulse app gets instant visibility of text messages. 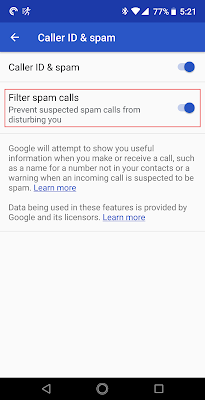 The Google Messages app still sees all the messages so apps like SMS Backup & Restore still work. 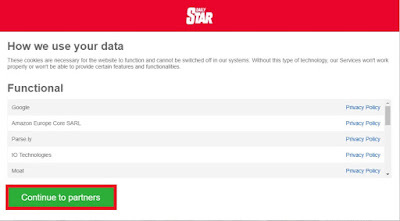 The web version requires you to create an account with Pulse and login to it. For that you get instant visibility to your phone's text messages. All of the issues I had with Join were solved with Pulse. Both Join and Pulse are paid apps. Both also require that your phone is turned on and connected to data and cellular networks. Post script: Just for giggles I tried messages.att.net again. It worked fine. My history was empty (it only goes back 90 days) but otherwise it worked. PS. Don't do anything until you read Part 2 next week.